Founded in 1995 by Sam White, Loan Market began as Ray White Financial Services, a natural extension of the Ray White real estate business. The business rapidly grew through the 90’s and by 2001 the company’s loan book reached $1 billion. 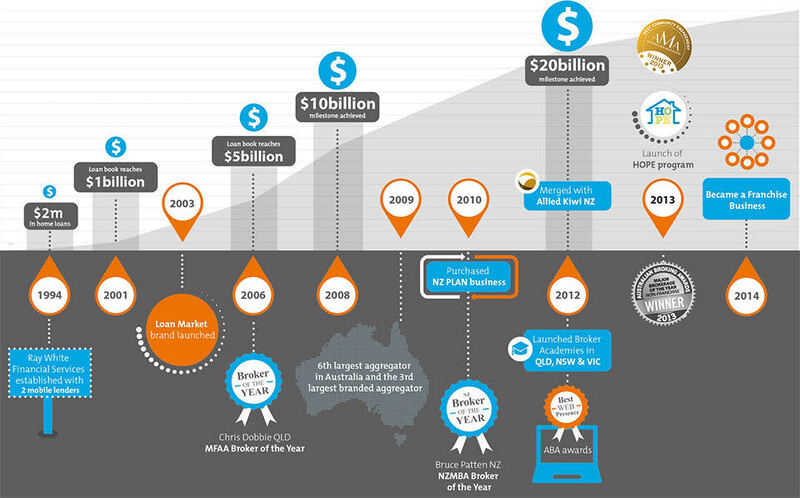 In 2003, the Loan Market brand was launched and the company had over 200 brokers throughout Australia. By 2014 our brokers had secured over $47 billion of home loans for thousands of Australians. Today, Loan Market has cemented itself as one of the largest mortgage brokers in Australia. Over the past decade, Loan Market has expanded into New Zealand growing our network to over 1,000 brokers internationally.